The Salzmann pine (Pinus nigra ssp. salzmannii) is an endemic subspecies of black pine native to the Western Mediterranean basin. In Spain, Salzmann pine covers extensive areas (approx. 350 000 ha), while in France where few scattered populations subsist, its distribution area is estimated at approx. 3 000 ha. 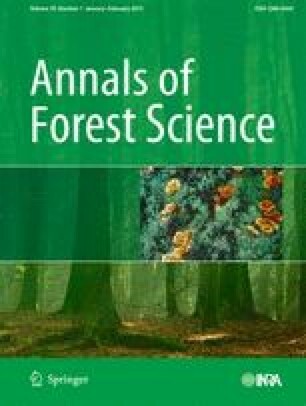 We used a dendroecological approach to understand the impact of climate fluctuations on Salzmann pine from France. Spatial and temporal variability of radial growth response was compared in three ecologically different populations (Conflent, Gorges du Tarn, Saint-Guilhem-le-Désert). The Conflent population showed a strong sensitivity to spring precipitation deficits (March to June), while at Gorges du Tarn and Saint-Guilhem sites, autumn (October) of the previous year and winter (February) temperatures explained more variance than precipitations and were, respectively, negatively and positively correlated to radial growth. Although covering a limited distribution range in France, Salzmann pine demonstrated large differences in radial growth response to climate and soil variations. We submit this article within the framework of special MedPine4 conference (Avignon, 6–10 June 2011). We gratefully acknowledge Norbert Turion, Olivier Gilg, and Franck Rei (INRA UEFM, Avignon) for the field work and the “Programme global de conservation des populations françaises de pin de Salzmann” funded by the French National Forest Service (ONF) for the financial support. We also thank Mélanie Saulnier and Élodie Brisset (UMR IMBE, Aix-Marseille University) for the technical advice.